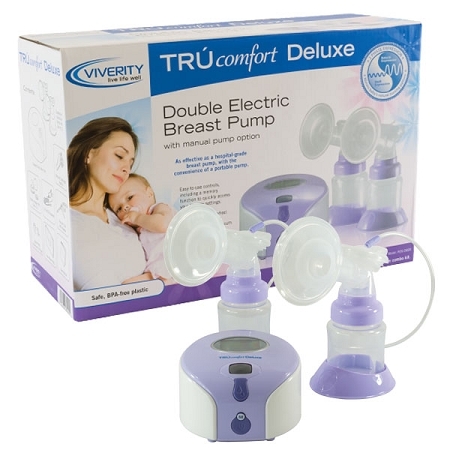 The TRÚcomfort Deluxe is a double electric breast pump which combines the effectiveness of a hospital-grade pump with the convenience of a portable pump. It comes with two collection bottles for expressing both breasts simultaneously. It uses a closed-system diaphragm which prevents milk from coming in contact with the tubing or motor. This lightweight quiet pump weighs less than one pound, yet it is durable and dependable enough for daily pumping. With three preset expression patterns and eight vacuum suction levels, the TRÚcomfort Deluxe can be easily customized to match a baby’s nursing habits. The vacuum suction strength can be adjusted independent of the expression pattern cycle. Toggling between the expression patterns with the expression button is simple. Suction strength is easily adjusted by turning the vacuum adjusting wheel. All changes are gradual to keep the mother comfortable while pumping. The TRÚcomfort Deluxe is built with the innovative “M” Button (My Favorite Mode) which can be programmed to remember a mother’s favorite pumping patterns and recall it for future pumping sessions. The pump also features an easy-to-read LCD display, user-friendly controls, a clock with an alarm to remind mothers when to begin their next expressing session. It can be electric-powered, battery operated, or converted into a manual pump (Manual Pump Diaphragm Kit included). Fits perfectly into the convenient carrying tote (included) for a complete portable solution.